Small pot of the Agar Agar powder which has been used for thousands of years to gel and thicken. 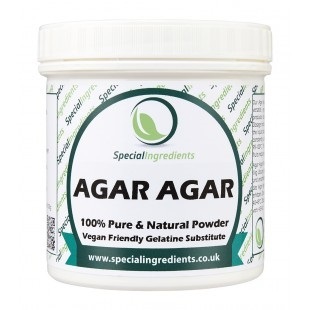 Agar Agar is a versatile vegetarian gelling and thickening agent. It is mainly used a superior vegetarian alternative to gelatine. Unlike gelatine Agar has no taste - so it can be used to make delicious gels that doesn't taste of powdered pigs bones! Our Agar Agar provides odourless, colourless superior quality gels even at very low concentrations. Agar Agar has been used for centuries to make jellies and sweets. It is extracted from red algae that comes from the North African coastline and seas around Southern Europe, Chile and Asia. After harvesting, the plants are dried, ground and washed. Agar Agar becomes soluble at about 90-100C and sets on cooling of the solution at around 40 - 45C. Agar Agar gels may then be reheated up to 85C without any melting. Thanks to this property, agar is invaluable for modifying the structure of hot creams and mousse. Produce heat resistant gels and jellies that can withstand temperatures of 85C . Produce strong, rigid gels that can be sliced. It can be used to produce a hard, brittle, transparent and neutral gel that resists acidic pH down to 3.5. Gels made from agar melt in the mouth - giving excellent flavour release. Use in a whipper gun to make light heat stable mousses, hot foams or hot chantilly. Use to improve jams & custards texture. Add to fruit juice to produce heat stable purees. Create fluid gels for sauces. Use to make jam as a substitute for pectin. Use Agar at a concentration of 2-10g per kg of the solution. To make a firm jelly/gel you will require approximately 7-10g. Soak the Agar Agar in the liquid solution for 5-10 minutes, then gently bring to the boil stirring constantly until all of the Agar Agar is disolved, heat the solution to 100C. The solution will then set upon cooling around 40 - 45C. 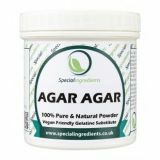 The gelling abilities of Agar Agar are affected by the acidity or alkalinity of the ingredients. Acidic fruits require greater amounts of Agar Agar. The Ph Solubility of Agar Agar is: 4.5 - 9.0. If you have not used enough Agar Agar the solution can be boiled and more Agar Agar added to get the texture you require. Agar is a permitted food additive and is assigned EU number E406. Use of this product is not recommended for babies and young infants. For all commercial use, please read our disclaimer and advice and refer to regulatory texts for limitations to use. Use Agar at a concentration of 2-10g per kg of the solution. To make a firm jelly/gel you will require approximately 7-10g. Soak the Agar Agar in the liquid solution for 5-10 minutes, then gently bring to the boil stirring constantly until all of the Agar Agar is disolved, heat the solution to 100C. The solution will then set upon cooling around 40 - 45C. The gelling abilities of Agar Agar are affected by the acidity or alkalinity of the ingredients. Acidic fruits require greater amounts of Agar Agar. The Ph Solubility of Agar Agar is: 4.5-9.0. If you have not used enough Agar Agar the solution can be boiled and more Agar Agar added to get the texture you require.